I've made roasted grapes before. In fact, it's one of my favorite things to serve along side a cheese platter. 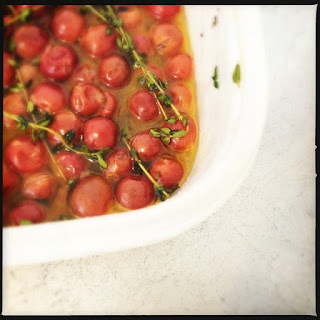 I also use them in a wine-based sauce to go with grilled or oven-roasted meats. 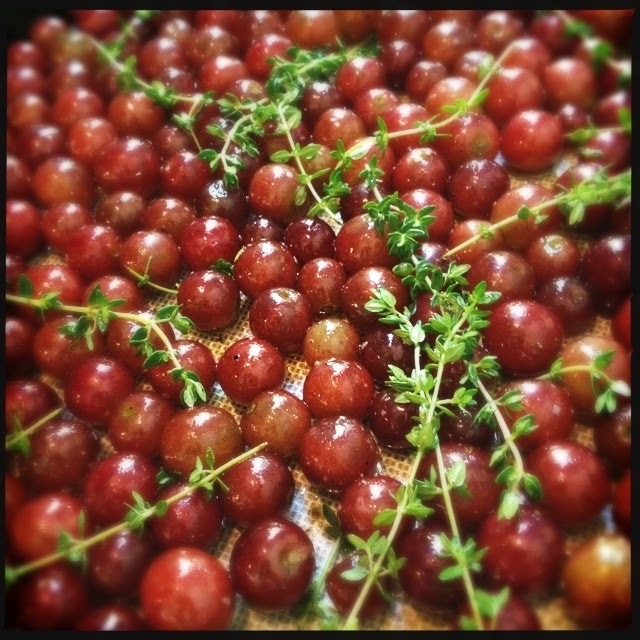 My method is simple: wash some red seedless grapes, throw them naked onto a silicone mat-lined baking sheet, and cook in the oven at 400 degrees for 10-15 minutes, just until they soften & start to split. That's it. I recently came across a slightly fancier version on Pinterest and decided to try it. This recipe called for tossing the grapes with olive oil, fresh thyme sprigs, salt & pepper before roasting at a high temperature. While this results in a much more flavorful condiment, I thought the grapes got a little too juicy. This would be GREAT as a base for sauce, though, and I'll use this method for sauce-making next time. However, if I were eating the grapes with cheese & crackers again, I'd go with my "naked" method. Spread grapes onto a sheet pan lined with a silicone baking mat. Drizzle with olive oil. Sprinkle with salt & pepper. Lay thyme leaves over top. Toss all together gently with your hands. Place pan in the oven for 7 to 10 minutes or until grapes just begin to burst.